It is a well-known fact that doubling the engine capacity does not result in a doubled speed of the ship. Considerable effort has to be invested to achieve every next knot of because the largest part of the engine capacity is spent on overcoming the resistance of waves as the ship moves in water. There were other schemes for optimising parameters “engine power – ship speed”, for example, by placing the key engines and fuel tanks in the underwater hull part of the ship which has been built in the form of torpedoes thus enabling to considerably reduce hydrodynamic resistance. This construction scheme is called the SWATH (Small Water-plane Area Twin Hull) technology. part, ships for services, pilots and environment control. Until now the SWATH technology has not been used in naval shipbuilding. It is known that armies and navies of smaller countries are frequently used as testing grounds of some sort for testing new military technologies, ideas and organisational solutions, including the testing of new perspective types of armament. Latvia is a maritime country. The largest part of its economy depends directly or indirectly on the sea and transit thus providing maritime safety in its waters is one of the national priorities of Latvia as well as an object of international commitments. Due to this reason the Latvian Naval Forces became pioneers in using SWATH ships for naval needs. 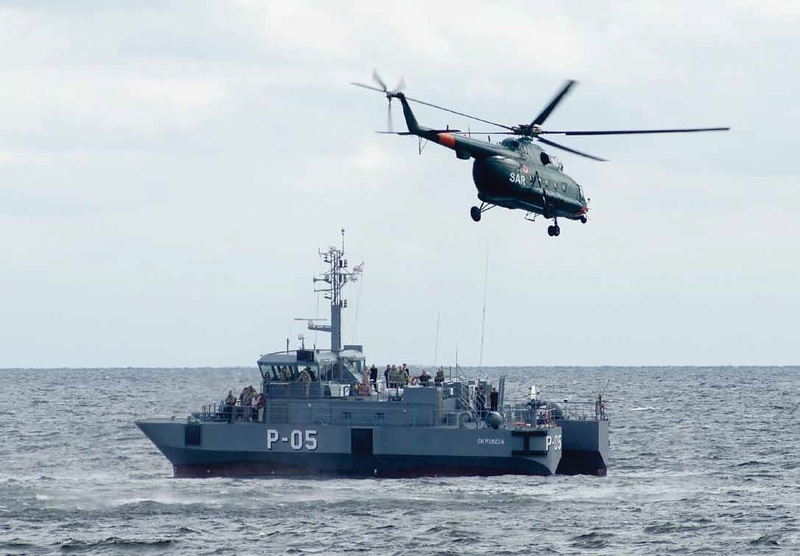 Several officers of the Latvian Naval Forces participated in developing the idea to use the SWATH technology and the technical task: Commander of the National Armed Forces, ViceAdmiral Gaidis Andrejs Zeibots, Commanders of the Naval Forces – Naval Captain Ilmārs Lešinskis and Naval Captain Aleksandrs Pavlovičs, Chief of Staff of the Naval Forces Command Captain Andrejs Zvaigzne, Commander of the Coast Guard Service, Naval Captain Hermanis Černovs. These experienced officers well-aware of the specific nature of the military service in the Baltic and respecting the best traditions of Latvian sailors became authors of the concept for using SWATH ships for the needs of Latvian Naval Forces. Ships were built according to the “keel upward” scheme. After the first stage of construction was finished, the hull was turned over and work continued – the body of the deck was built, shipping equipment installed. Two MAN D2842 diesels were installed in the “torpedoes” during the assembly. The main engines were equipped with reverse reducers ensuring a smooth switchover to backward running. Two Volvo diesel-drive generators were assembled already in the upper body of the ship. The seaworthiness of SWATH type ships is up to 5 points and they are stable when navigating in stormy waters. The ship is equipped with everything required for the work of the eight-man crew. The building of one ship lasts for a year and a half. The naval ship must perform a multitude of functions therefore the new ships were equipped with reinforcements to stabilise changeable container modules with various equipment. These can be modules of armament, divers’ equipment and other types.